Wednesday 22nd March 2017 sees the launch of the Kickstarter campaign by the Colin Currie Group to record Steve Reich’s seminal work “Drumming”. This work was the key to forming the ensemble in 2006 when the BBC asked me to curate a concert for the Proms to celebrate Steve’s 70th birthday. I immediately turned to “Drumming” as I was compelled to learn from and unpick what remains a brilliantly profound and searching work of extraordinary originality. Since that time the group has taken the work under its wings, and with the composer’s endorsement, become the ambassador for the piece. Now, in Steve’s 80th year, and hence ten years into the group’s existence, the time feels right to make an enduring document of this journey, and make a recording of “Drumming”. And this is where the campaign kicks in! 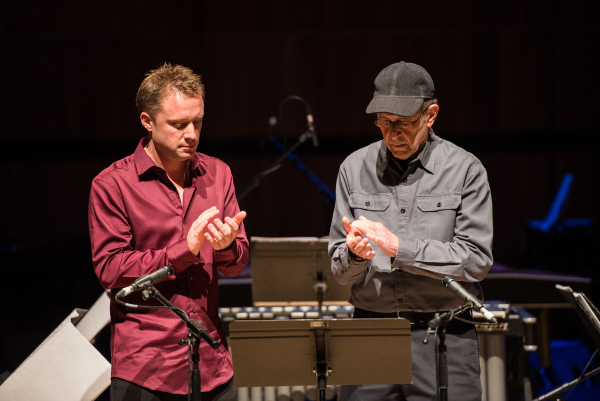 We have everything in place – dates, all musicians, venue, production team…we just need enough Steve Reich fans and supporters of our work to make this all get a green light and become reality. There are various incentives for you to contribute! You can pre-order the album, receive CCG goodies, meet the band, get a percussion lesson with me, attend the sessions and even record “Clapping Music” yourself if you have deep enough pockets!! More than anything, I’d be very grateful if you spread the word on this project by passing the info around and encouraging others to be part of this truly exciting endeavour. Three weeks from now, we will know if we have reached our target! So, stay tuned and stay close to this unique adventure to capture the greatest DRUMMING ever recorded!